The game started brightly despite the heavy under foot conditions and in the fifth minute, McDonald scorned a good chance when he dragged his shot past the post after being set up by Cameron. Two minutes later, Milne got on to the end of a Gay free kick, but failed to hit the target. In the 11th minute, McDonald got past his marker, rounded the keeper, but mishit his shot and the ball was cleared. Then a header by Foster went straight into the arms of keeper Bruce. At the other end, an excellent diagonal pass picked out Lafferty, but his strike went wide of goal. Penicuik opened the scoring in the 16th minute when Moonie set CAMERON free and he coolly slotted the ball past Bruce into the bottom corner of the net. 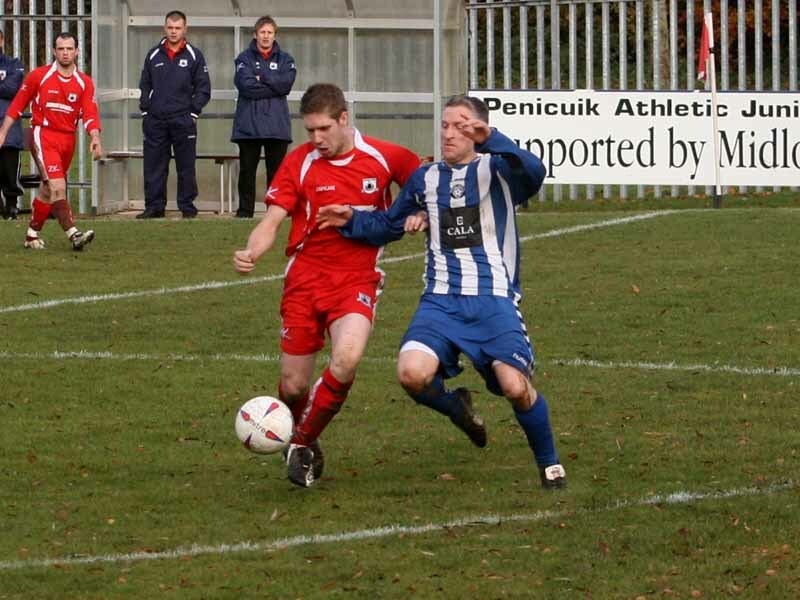 Five minutes later, Penicuik doubled their lead when GAY smashed home an unstoppable shot from 18 yards. Immediately afterwards, Cameron tried a deft chip, but keeper Bruce saved well. Penicuik were in control of the game, but failed to take advantage of the chances created, and in the 36th minute Newmains had a great opportunity to score, but were denied by a super save by Ramage. 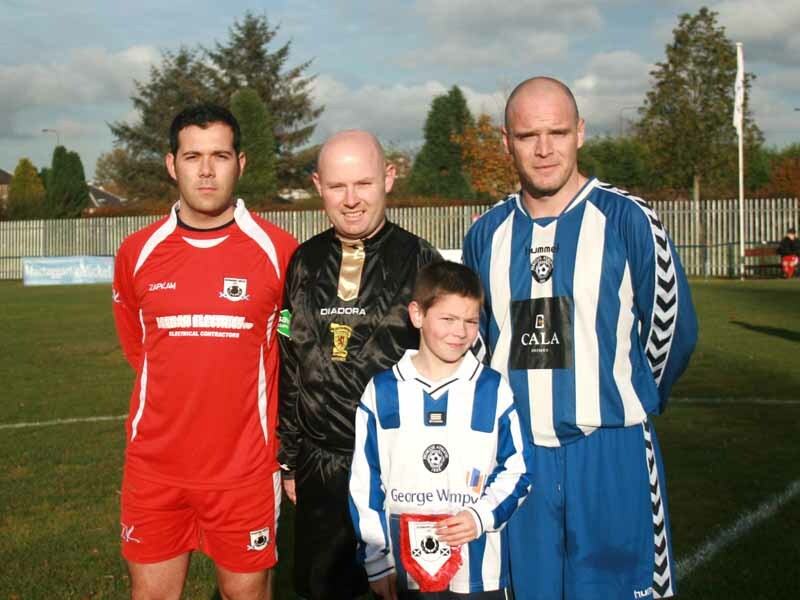 Then Penicuik broke quickly from defence and Moonie picked out Gay, but Bruce pulled off the save of the match to turn his shot past the post for a corner. In the 43rd minute, Newmains pulled back a goal when LAFFERTY scored an excellent individual goal. He left Meikle in his wake, drove into the box and side footed the ball into the bottom right hand corner of the net. Right on half time, following a Gay corner kick, Foster’s header was blocked on the line by Sloan and cleared. In the opening minute of the second half, a 20 yard shot by Foy went narrowly past the post. Then substitute Mangan got past Meikle only to shoot straight at Ramage in goal. One minute later, Milne laid the ball back into the path of Lynch, but his shot went high over the bar. In the 56th minute, following strong pressure by Penicuik, McDonald got to the ball before keeper Bruce, but his shot hit the side netting. Then a let off for Penicuik when they lost possession and Lafferty had only Ramage to beat, but the keeper blocked his strike. The ball fell again to Lafferty whose shot was again blocked amid loud claims for hand ball. Then in the 67th minute, a lung bursting run up the right wing by Gay saw him send over an inch perfect cross to the back post where CAMERON rose to head powerfully home. 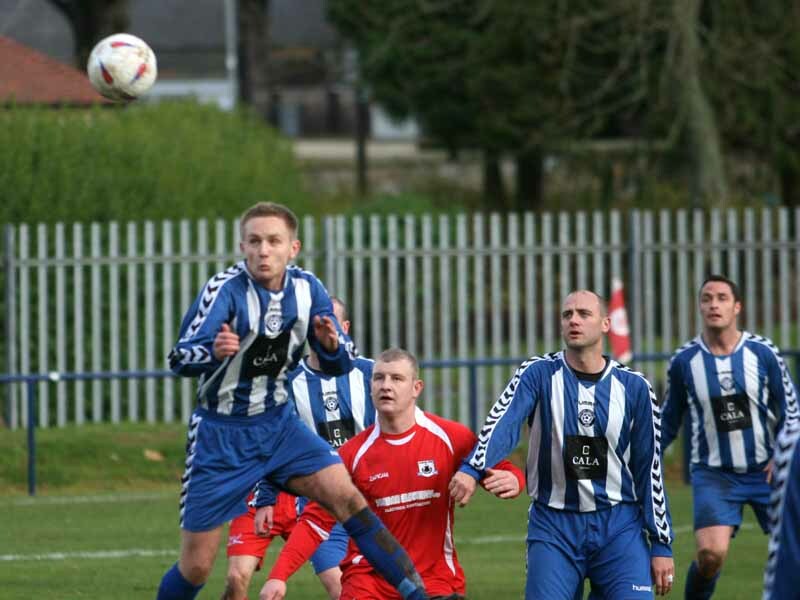 Penicuik added a fourth in the 72nd minute when CAMERON glanced home a header for his hat trick from a corner kick. Three minutes later, substitute Montgomery picked out Gay in the penalty box, he laid the ball back to McDonald, but he scooped his shot high over the crossbar. Then McDonald was inches away from poking home a mishit shot by Gay. 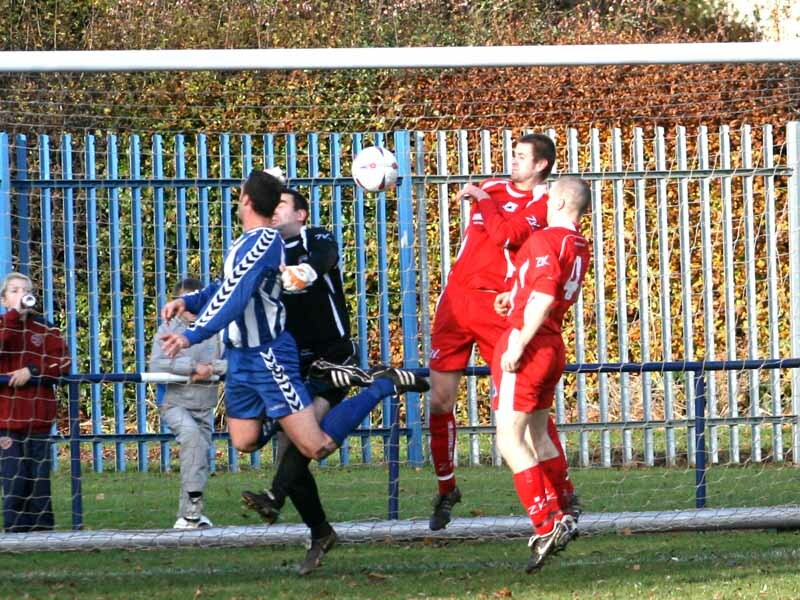 With Penicuik piling on the pressure, a foster header flashed inches past the post. In a rare Newmains attack, Mangan set up Lafferty, but Ramage rushed from goal to save. 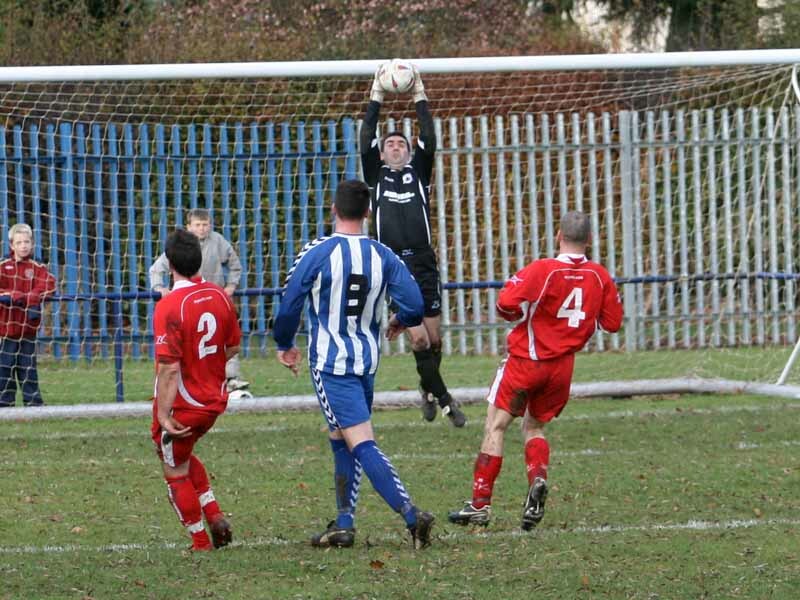 In Penicuik’s next attack, keeper Bruce pulled off a great save when he turned a header by Meikle round the post. However, in the 88th minute, a MONTGOMERY corner kick went through the hands of Bruce and into the net to complete the scoring.